A great website in minutes? Now, that's a Plus! We know that a Domain name search can be a daunting task. 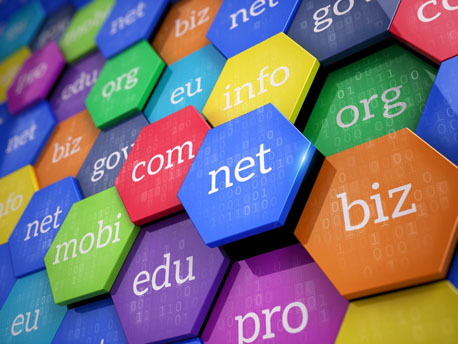 With all the domain names to search and choose from, finding the right domain name can be difficult. Call to +91-98154-55397 we will guide you to choose the best domain name extension. Domain registration and domain management is fast and easy when you know what you are doing. Let us manage this job for you. Registering your domain is one of the first steps in building value to your website. Website Design can change but your domain will stay the same and will become a major asset if you pursue online marketing and the development of your online presence. Your domain name is your address on the internet, and just like in the real world, online location is still everything. Ink Web Solutions are an experienced affordable Domain Registration, Web Hosting India, Chandigarh, Mohali, Panchkula and Himachal Pradesh provider offering business web hosting, corporate hosting, Email Hosting Solutions and Dedicated Servers. Our Linux web hosting services with fast reliable connectivity, quality customer support and cPanel control panel have been used by hundred of customers. Please do not hesitate to ask us for references. Our reliable and affordable Web Hosting India, Chandigarh, Mohali, Panchkula and Himachal Pradesh plans are Linux based and provide you with the most reasonably priced, user friendly and support oriented business web hosting solutions. Linux hosting has been the tried and trusted choice for a long time and not much needs to be said about the unparalleled reliability, speed and functionality of Linux web hosting. Our industrial grade servers connected with multi-homed high speed backbones in USA create a truly robust business web hosting platform for you. We offer cPanel (control panel) with all our "India, Chandigarh, Mohali, Panchkula and Himachal Pradesh" to help you manage your web site. It provides an intuitive business hosting interface that allows creating e-mail accounts, changing passwords of your POP e-mail accounts, updating content, setting up FTP accounts, generating site visitor reports / graphs, creating password protected directories, setting up cron jobs, managing MySQL databases etc. with simple clicks. Online free web hosting video tutorials for cPanel are available on our website. Our unending focus is on harnessing the best of marketing, strategic and technical skills for development of customer-oriented, innovative and affordable "Web hosting India Chandigarh, Mohali, Panchkula and Himachal Pradesh". Timely implementation of high quality workmanship" and "quality service at reasonable prices" are our major strengths. Give our company a try and experience our QOS. Chandigarh's Leading Domain Registration Company ! Ink Web Solution provides Domain Registration services in Chandigarh, Mohali, Himachal Pradesh and India. Domain names are public, which means that contact information is available with WHOIS queries. Protect your personal information with our Privacy feature. Security matters. Secure your domain name against slamming, hijacking or other forms of unauthorized modifications.